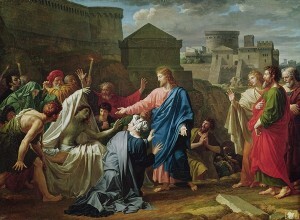 Jesus Resurrecting the Son of the Widow of Nain (oil on canvas) by Bouillon. Michael Kok is addressing the arguments for and against Q on his blog where he explores the “history and reception of New Testament writings”. In his latest post he raises the question of whether Luke knew Matthew’s account of the baptism of Jesus. Unfortunately his comment policy does not encourage responses from outsiders hence this post. My own view is that Q is too easily dismissed with assertions like “it is only a hypothetical document” and “Occam’s razor suggests Luke knew Matthew” without actually investigating the arguments in its favour. The questions debated by those who are more aware of the arguments also can often by narrowly focused; historical inquiry ought to begin with a clarification of the broader context of the evidence being evaluated. I argue below that an anti-Marcionite agenda explains well the differences between Matthew’s and Luke’s baptism scenarios. Before comparing the Gospel of Luke with anything it is worth clarifying what we understand by that Gospel and the scholarship surrounding its genre, its development and its appearance in the historical record. If we find the arguments of Joseph Tyson plausible then we begin with the probability that our canonical gospel emerged in two stages: first a proto-Luke; followed by a heavily redacted treatment of that earlier document to give us our Luke-Acts. Tyson does not dispute Q, by the way, and his model does have “Luke” use Q and Mark, but at the same time he brings together a wealth of other scholarship relating to the question of Luke’s development and emergence in the record that is of relevance to Kok’s discussion. In the fifteenth year of the reign of Tiberius Caesar, Pontius Pilate being governor of Judea, and Herod being tetrarch of Galilee, and his brother Philip tetrarch of the region of Ituraea and Trachonitis, and Lysanias tetrarch of Abilene . . . . This is also the place where Marcion’s gospel began. Marcion’s gospel did not include the John the Baptist narrative, however. The opening verse was followed with Jesus’ entry into the world (probably starting at Capernaum) preaching the gospel. For readers not familiar with Marcion: The Marcionite “heresy” flourished in the early/mid second century and taught that Jesus was sent by a Higher God than the lesser Creator God of the Jewish Scriptures. Marcionite teaching held that the Law and Prophets had nothing to do with the true Messiah and were in fact given to the Jews by a fickle god and prophesied of some other earthly messiah of relevance to the Jews only and who was of no account beside the Son of the Highest God. If the subsequent stage of the Gospel of Luke was indeed an anti-Marcionite embellishment (as Tyson and several other scholars have argued) — and the evidence for this canonical version of Luke only makes its appearance after the mid-second century — then it is surely safe to conclude on chronological grounds that the “canonical redactor” did indeed know of the Gospel of Matthew. Further, it is surely relatively safe to think that our redactor had an interest in shaping the baptist scenario to rebut Marcionism. The question to ask then is whether canonical Luke functions as an anti-Marcionite document, and in particular to ask whether the treatment of Jesus’ baptism functions the same way. If so, does the suggested political context (anti-Marcionite) explain Luke’s differences from Matthew’s baptism scenario? Is Ehrman’s Pre-Pauline Quotation an Anti-Marcionite Interpolation? the earliest devotees of Jesus viewed him as a normal man, a human messiah, who had been exalted to become God’s son at the resurrection. Later, Christians came to think that he was the Son of God prior to the resurrection and reasoned that he had been adopted as God’s son at his baptism, as we read in the Gospel of Mark. Still later others moved his divine sonship back to the time of his birth in Bethlehem. The Gospels of Matthew and Luke indicate that Jesus only came into existence as God’s son when born to Mary. 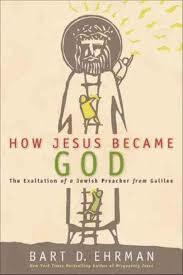 Later still Jesus was thought to have been always divine, even before appearing as a man, as we read in the prologue to the Gospel of John. Ehrman is well aware that the rest of Paul’s writings inform us that Paul had a much higher view of Jesus than we read in these opening verses of Romans. So I think his larger argument still founders on the reef of Paul. But my interest here is Ehrman’s use of Romans 1:3-4 as the starting point from which he builds his case. it could represent early tradition . . . from the early years in Palestine after Jesus’s first followers came to believe that he had been raised from the dead. Another reason to judge the passage early appears to be the focus on Jesus as the Davidic Messiah. Ehrman calls upon the much later gospels to support him here. He uses their late testimony (in the belief that true historical data can be gleaned from them via criteria of authenticity) to affirm that the disciples of Jesus believed he was the Davidic messiah in his own lifetime and that they continued to believe this after his death (even though he failed to overthrow Rome as the Davidic messiah was supposed to do) because of the power he attained with his resurrection. Why think the words are not Paul’s own but a quotation of a well-known creed? This post continues from The (Apellean) Gospel of Peregrinus and concludes the series. In posts two through six I showed why Peregrinus should be regarded as the author of the so-called Ignatian letters. In posts seven through eleven I argued that he was an Apellean Christian. In this post I will tie up some loose ends, adding some thoughts regarding the date of his letters, and taking a somewhat speculative last look at his community, the Apelleans. WHEN WERE THE ORIGINAL LETTERS WRITTEN? MODIFYING THE LETTERS: WHEN? WHY? WHO? How did he come by the letters? WHAT BECAME OF THE APELLEAN GOSPEL? Basis of the Gospel of John? Identifying the Paraclete (the mysterious witness to Jesus) : The Holy Spirit or Paul? Identifying the Beloved Disciple: Paul? Paul (“little one”) the boy disciple? AND WHAT BECAME OF THE APELLEANS? Identifying the woman taken in adultery? This post concludes my treatment of chapter 6 of ‘Is This Not the Carpenter?’, “Does the Christ Myth Theory Require an Early Date for the Pauline Epistles?” by Robert M. Price. Price concludes his article with a discussion of the place Marcion might have had in the history of gospel origins. Specifically, what if Marcion was responsible for much of the Pauline corpus or even wrote the letters himself? Would not this mean that the Gospels preceded Paul’s letters and would not one of the “pillars of the Christ Myth hypothesis” fall? What follows is my outline of Price’s argument. The conventional view of Marcion is that he appears controversially armed with a number of letters of Paul and a single Gospel. This Gospel, we are usually informed, was a shorter version of what we know as the Gospel of Luke, Marcion having deleted from the original Gospel all the passages he believed were falsely interpolated contrary to the original faith taught by Paul. There have been other opinions. Some have argued that Marcion’s gospel was for most part an original and early version of what became our Gospel of Luke, an Ur-Lukas. Paul-Louis Couchoud argued this. More recently, Matthias Klinghardt argued a similar case. (Hence my previous post.) Price does not mention Joseph Tyson here, but he also argued much the same, and I linked to that series of posts on his book in my post on Klinghardt’s argument. The idea of a Proto-Luke stands independently of any Marcionite association, however. It has been argued by B. F. Streeter (link is to the full text online) and Vincent Taylor. G. R. S. Mead suggested Marcion had no Gospel but but only a collection of sayings, not unlike Q.
Matthias Klinghardt responded to Mark Goodacre’s 2002 book, The Case Against Q, with an article proposing a Marcionite solution to the Synoptic Problem: “The Marcionite Gospel and the Synoptic Problem: A New Suggestion” published in Novum Testamentum, 2008. The Griesbach or Two-Gospel theory — that Mark was the last gospel to be composed — is a minority view. Recently published proponents are William R. Farmer, Allan McNicol and David Peabody (Klinghardt, p.2). and C. S. Rodd (2003) (review). As for the minor agreements, Goodacre has a strong point insisting on the principal independence of Matthew and Luke according to the 2DH. This excludes the evasive solution that, although basically independent from one another, Luke knew and used Matthew in certain instances. Methodologically, it is not permissible to develop a theory on a certain assumption and then abandon this very assumption in order to get rid of some left over problems the theory could not sufficiently explain. The methodological inconsistency of this solution would be less severe, if “Q” existed. But since “Q” owes its existence completely to the conclusions drawn from a hypothetical model, such an argument flies in the face of logic: it annuls its own basis. This is the reason why Goodacre’s reference to the hypothetical character of “Q” carries a lot of weight. More weight, certainly, than Kloppenborg would concede: he tries to insinuate that Mark is as hypothetical as “Q”, since Mark “is not an extant document, but a text that is reconstructed from much later manuscripts.” This exaggeration disguises the critical point: the hypothetical character of the “document Q” would certainly not pose a problem, if “Q” was based on existing manuscript evidence the way Mark is. I don’t know if Couchoud here means to suggest “the editor” wrote these epistles himself. I find it difficult to accept the two letters attributed to Peter are by the same hand given what I have come to understand of their strikingly different styles, but let’s leave that question aside for now and cover what Couchoud’s views were as published in English 1939. This epistle is said to have been a warrant for the Gospel of Mark. (Maybe, but some have suggested the name of Mark for the gospel was taken from this epistle. If it were a warrant for Mark one might be led to call to mind the unusual character of that Gospel. Its reputation had been tinged with “heretical” associations.) In the epistle Peter calls Mark “my son” and is supposed to be in his company in Rome, biblically called “Babylon”. The inference this leads to is that Mark wrote of the life and death of Jesus as learned from the eyewitness Peter. This coheres with Justin’s own naming of the Gospel “Recollections of Peter” in his Dialogue, section 106. Was Marcion Right about Paul’s letters? Couchoud’s books contain many valuable insights. He was rightly dissatisfied with the mainstream scenario of Christian origins, and he rearranged the pieces of the puzzle together in a new way that provides a fresh perspective on them. There is much that he says that I agree with. I would not be surprised, for instance, if he is right about the role played by Clement of Rome. But I am disappointed that Couchoud—like practically everyone else—still does not take seriously Marcion’s claim that the original author of the Gospel and Pauline letter collection was someone who professed allegiance to a God higher than the Creator of this world, to a God higher than the God of the Jews. My Couchoud series posts (outlines of his work discussing the beginnings of Christianity, The Creation of Christ) are archived here. This post continues the series. The churches in Clement’s day, and in particular the Church of Rome, were governed by Elders. Paul, of course, knew of no such institution. The heads of the various churches in his day were the Prophets. I continue here the series covering Paul Louis Couchoud’s argument for the creation of the canonical New Testament literature from the 1939 English translation of his The Creation of Christ: An Outline of the Beginnings of Christianity. The series is archived here — scroll to the bottom for the first posts where the overall purpose for which the literature is covered, along with when and why and why Couchoud suspects Clement of Rome as the editor (and author) responsible. The guiding principle for the structure was Marcion’s “canon” that began with a Gospel and included ten letters of Paul. Background: In brief, Marcion was a prominent leader of a form of Christianity that (at least until recently) has been generally believed to have rejected totally the Old Testament and taught that Jesus came down from heaven to preach about an Alien (unknown) God who was all love and higher than the Jewish God of the law and judgment. Marcion claimed Paul as his sole apostolic authority in opposition to the other apostles who never understood Christ’s message. Couchoud argues that a Roman church elder (he suspects Clement) attempted to unite the diverse Christianities represented by competing Gospels (such as Marcion’s Gospel, Matthew, John, Mark) bringing them all together through the themes expressed in Luke and Acts (his own creations, though Luke was largely a re-write of Marcion’s Gospel) except for the intolerable Marcionite views that had to be countered. Couchoud has covered the creations and compilation of the Gospels and Acts, and now comes to the orthodox versions of the Pauline letters. Marcion had selected Galatians as the most appropriate for the introduction of Paul’s thought; “Clement”(?) preferred Romans as the one most potentially adaptable as a frame of reference for the “correct” reading of Paul’s corpus. (Marcion had placed it fourth.) This would leave nothing more to do than revise a few details here and there in the other letters. is an outline explication of the Gospel of Luke from Couchoud’s perspective of it having been composed around 142 c.e. by Clement of Rome. The prologue refers to a number of Gospels and Acts already in existence and leads readers to infer that the author is collating his information from these earlier sources while also being in a unique position to offer more authoritative insights and a more coherent narrative of the whole. And his wife was of the daughters of Aaron, and her name was Elizabeth. In all the commandments and ordinances of the Lord blameless. Both were well stricken in years. Continuing here with Couchoud’s views of second century gospel origins. Earlier posts, including explanations for the reasons etc for these posts, are archived here. C’s story of John’s gospel begins with a setting in Ephesus, two generations after the feverish hopes for the coming of the Lord that produced the Book of Revelation. The church at Ephesus “preserved the tradition of the pillar apostle who had seen the Lord, for in this lay its claim to fame and to authority.” (p. 223) Apocalyptic enthusiasm had dwindled away and been replaced by a mysticism that experienced Christ as having come in the “here and now” in spirit and in their own flesh. Paul’s teachings about a mystical union with Christ also primary, according ot the evidence of “Ignatius” in his letter to the Ephesians, so much so that Paul’s concept of baptism as symbolic of death and burial had been superseded by the idea of baptism as a principle of a new life in Christ, with eternal life being granted at the moment of emerging from the real “water of life”. These Christians were “born again” here and now and forever. They lived here and now in Light and Life. They could see and touch here and now the miracles of that divine life in full joy and love. The love was, however, a cultic love for their own brethren and worshiped spirits and not for the world. The prophets were revered, but also tested to see that they were not false and that they carried the same teaching of Christ having come now in the flesh. Like Marcion’s gospel there is no mention of an author — “unless ‘the beginning of the gospel of Jesus Christ’ is intended to give the author” (p. 170). Couchoud earlier made the point that Marcion’s gospel was likewise anonymous and if pushed his followers would say it was “Christ’s” gospel. This post follows on from the previous one outlining Couchoud’s thoughts on Gospel origins. It starts with highlights from what he believes (generally following Harnack) Marcion‘s Gospel contained; looks at the next Gospel written apparently by Basilides; then at the way our canonical Gospel of Mark took shape and why, followed by the Gospels of Matthew, John and Luke. It was placed with the letters of Paul and a commentary, the Antithesis, as a replacement for the Jewish scriptures.